This is another quick update on the position in Nepal. We have just had an announcement from the British manager at the yak and yeti hotel that they are expecting a bigger quake than yesterday in the next 2 to 3 hours we are all in the garden trying to stay safe. The Yak and Yeyi hotel is a strong hotel built by the Japanese and supposedly earthquake proof. My beautiful Nepalese family this morning went to their room outside Thamel. They have lost their home and animals in the village many families have died. Thank god they came to Kathmandu for their first visit on Thursday so at least Mum, Dad and the 5 girls are together. Yesterday when the quake struck myself the girls and their mum were inside the palace museum. It was so frightening we ran to door supports for safety, huge chandeliers were swinging like pendulums it was about 2 minutes later when someone came to direct us to safety. There are 72 rooms in the building and we were in room 10 when the quake struck. At the time we had no idea how to get out. We then spent all afternoon sitting in the grounds of the palace before I decided to move to the Yak and Yeti hotel. My luggage was at another hotel in Thamel so this morning Shanti and took a taxi to the hotel thank god it was still standing. My room was on the 3rd floor and u have never seen anyone run up stairs so fast and throw things into a bag,and get out of there. Thank you from my heart to everyone who has messaged me and emailed. I apologise if my response has been a little abrupt but you can understand that all important emails and texts to family are my priority, as well my clients families who are obviously concerned a output their safety. Well you probably been wondering what has been happening these past few days after the huge quake registering I was told 8.9 on the r scale. I may have mentioned (please forgive me if I have repeated myself ) I was in the Kings Palace museum which is a 72 room building with only one way in and one way out! Funny how one enters a building and does not take notice of hoe to get out. Will this will never never happsx me again and I hope to you all out there! One does not have time to think when an earthquake happens whether 5 or 10 on the scale, it is those seconds between when what is happening to you and what you do in this situation. Fortunately my brain kicked in and I grabbed the 5 girls and their mother and headed to a door, we all clung to each other for safety. It was possibly only 3 minutes boy pt felt like 3 hours before a security guard came and showed us the way out, I was the only western person with about 50 Nepalese, they were screaming but fortunately not stampeding. We made it outside to the grass area and hit the ground. Then after 15 mins another hit, but I knew we were safe. It was unusually cold for this time of year, but some did not have jackets and together with shock and cold you begin to shake. We sat there for 5 hours then I decided to move us to the Yak and Yeti 5 star hotel ba 5 minute walk and where I have been staying with my groups for 15 years. We walked down the middle of the road for safety arrived at the hotel and was provided with a room that has access to the garden, but I decided the best place to sleep was the garden, I have been there for 3 nights, met many lovely people. The girls returned to their room yesterday morning after Shanti and I went to the other hotel to collect my luggage I did not see a lot of damage on the way. Today I went to the Australian embassy and again same deprecation not a lot of visual damage but I can image the structural damage is massive. Today I had my first shower before that I was too frightened to not only go to the toilet let alone get my clothes of. Last night we once again slept outside, there were 3 after shocks one at 6.4 everyone in the Kathmandu valley were advised to sleep outside layout night and NOT to be in their homes. Guess what it, it stormed all night with heavy rain, we were under tent shelter and safe but I could not sleep thinking about thousands of people sitting in the rain all night without shelter. This morning I took a taxi to the Australian embassy to register they had many tents in the garden for those who did not wish to stay in Thamel. I have not ventured to the other end of Thamel New Road Durbur square which was worst hit. We were there the previous day on the tower which vp collapsed and killed many people, we were in Durbar Square wether again many were killed and all 17 century temples destroyed. I have palled up with some journalist who were here not for the earthquake but a work study and they have ventured out to the most effected areas of Kathmandu, and have returned with stories that would shatter anyone. On a lighter side! I have the Prime Minister of Bhutan staying in the next room and the other side the Health Minister of Bhutan on the other side, so feeling safe to sleep in the room tonight. I am so very sad to let all of you that have who joined me on a visit to TB's home and his Uncle Chabi's home that all has been destroyed 35 houses have been lost. I am not sure how many if any lives have been lost. Fortunately the quake hit at midday when most are outside the home, many animals have been killed. Those who have lost homes are living in make shift tarpaulin covers. I have been told that Saraswati school has lost one wall and Shree Basari School is in tact. The primary school next to TBs home has collapsed. TB phoned me today advising me of the news, he wants to take his family back to the village asap to rebuild as it will be much safer health wise for his family than staying in Kathmandu where already fresh water is becoming scarce, as well as food. At least in the village they have fresh water and less likely of disease and are able to grow crops for food. It will be hard work for these people but they are very resilient and they have the materials to rebuild. Tonight we have just felt a slight tremor, but more now in Bangladesh and Darjeeling area tonight was the first time that I have shed tears, before all was serial now it is reality. Leaving for the airport at 7am I feel like I am deserting a sinking ship, but in my heart I know can help these people more from my home than being here in Nepal. Maybe some of you may remember when we left TBs village to go to Pokhara we went via Gorkha that area and Barpak was the epicentre of the quake and many many people in that area have lost their life. The Chinese government have been sending in helicopters to this area not only to rescue but to take bodies to Pasapatinath for cremation. 30th April 2015I think of the people of Nepal everyday and send prayers that families have survived this terrible disaster. 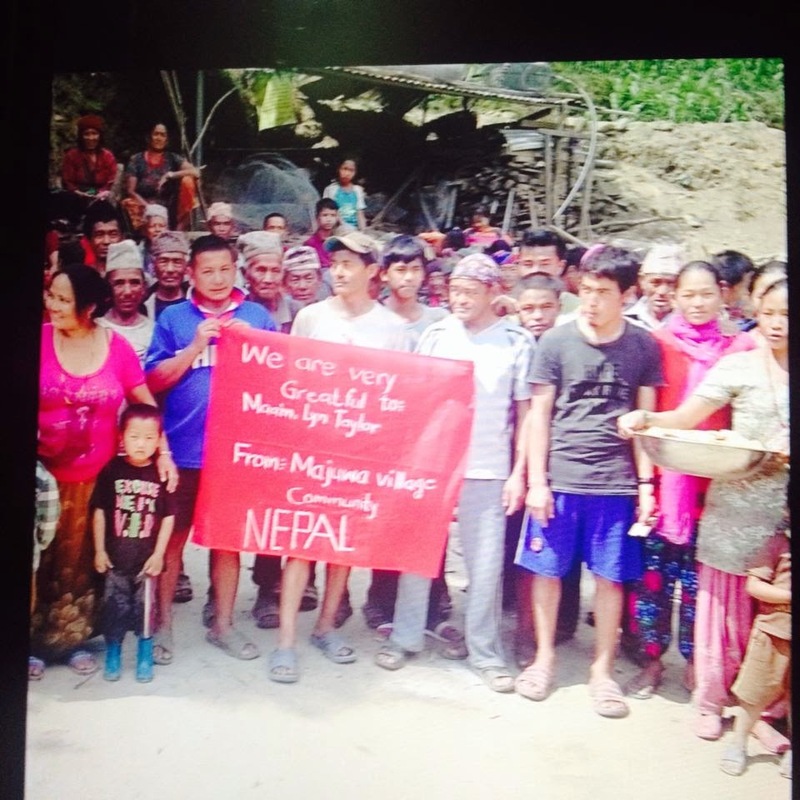 The world is on a mission to help the people of Nepal to rebuild their country. To those of us who have had the pleasure of visiting this beautiful country, and enjoyed a wonderful experience filled with passion, smiling faces, love and trust. Nepal is without doubt one of the most awe inspiring countries in the world, it may not look like it now, and people may think life is cruel, why us? BUT! I believe that they have survived a senseless war that separated the country and its people, it sent young men away to other countries to work, leaving women children and the elderly to work on the farms. Families left their village and moved to Kathmandu thinking it was safe, which on the other hand made Kathmandu a very congested and over crowded city. Now in the path of this disaster people are returning to their grass roots their villages and heritage, their families! 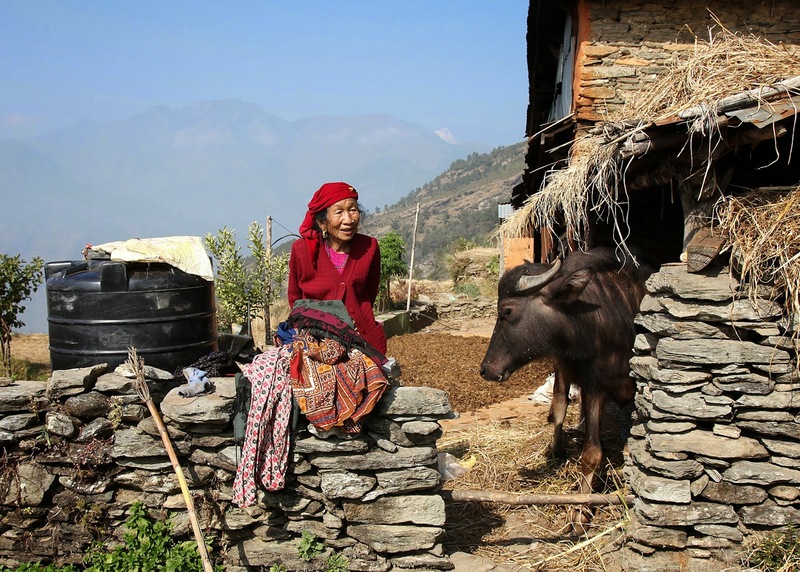 To allow Nepal to thrive and prosper and rise above this disaster it must first rebuild villages! And to do this man power is required, so it is a positive move that the young men are leaving Kathmandu and returning home to be with their families. Hopefully it will give them a purpose in life and unite families and traditions. On my return home I will set up a fund raising account for those who have offered their generous help. I would like you to know that this money will go direct to the people in the remote villages who need it, and not any other organisations. The money collected will possibly not be utilised for maybe up to 6 - 12 months. In these remote area villages The people will need to rebuild their homes with the materials that will be salvaged from the wreckage. The money will go towards the purchases of goats, buffalo and chickens, as most will have been killed. The money will also go towards materials for building anyone's home that cannot be salvaged. Nepalese are a very strong and resilient race of people, they are skilled tradesmen, and even if they don't have those skills they learn very quickly. The village people are strong, but now there are only women, children and elderly living in these villages as all the younger generation have left and gone to the city. As I write this the younger generation are now trying to return to their villages which is a good thing as more manpower in the village will help restore their lives. There is continuous fresh water in remote villages as well crops which may be lost but can be replanted it will all take time. Manpower and money. 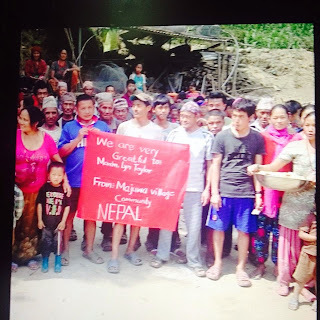 1st May 2015 In contact with Nepal every day and I am so thrilled to report that thanks to Red Cross Nepal today the villages of Baseri, Budduthum, Darje, Majuwa have to each home rice, soya beans, salt oil, blankets and some plastic tents. The received as well from the Government 7,000 rupees equivalent to approx Aust $110 per household. Although they still require more tents and tarpaulins, they are very happy people and thank the Red Cross and the Government of Nepal. On behalf of my fundraising campaign we will be sending over our first relief funds of Aust$3000 on Monday to 3 villagers that require Extra tents and tarpaulins, the people are being extremely pro active by building temporary buildings to store anything valuable to survive as well protecting the timber from rotting during the coming monsoon. I beg those Nepalese who read my post to approach the Government for your 7,000 rupees please do not be frightened to ask. Thanks to Roland Hunter from Phase, Helen Jean, Robin Boustead, Sita Gurung, Kul Gurung today together we have all made a difference to these wonderful people Just a quick update from Darje, Baseri, Mujuwa, Budduthum. The locals have been pro active in making temporary shelters. They have had a committee meeting with 92 house holders and have all agreed that their need is rice lentils, salt oil rather than tents and tarpaulins, so there for The funds of Aust$3000 that has been transferred will be used for this purpose. Future fundraising will go towards the restoration of schools and homes after monsoon. 2nd May 2015 Last night I was present to speak at a fundraising event put on by friends who trekked with me in Nepal. 2011 providing a great variety of local, national and international acts. This year it will be held from 9th to 11th October at Collaroy Beach. and hear first hand a bit about the damage and devastation she witnessed. it will be used where it is needed. Northern beaches music festival is Sydney's finest lakeside folk festival, 2 - 4 May 2014, boasting in some of Australia's most beautiful landscapes.